I have a problem with my new camera QHY174GPS and sharpcap. I am always with "badtimestamps". I am nevertheless in 8bits images. What is going on ? - to change the picture format. what data shows in the GPS window? - BadTimestamp is usually caused when the GPS says it has data, but the time in the data is more than 24 hours different from the PC system clock. As you know, you must be in 8 bit mode for the GPS to work at all. i am in 8 bits. Try without binning - I have no idea if it works with binning and have never tested it. I just tried, but it's not better without binning. so if I run the camera without plugging in the GPS module I see exactly what you are seeing (ie stays on BadTimestamp all the time). 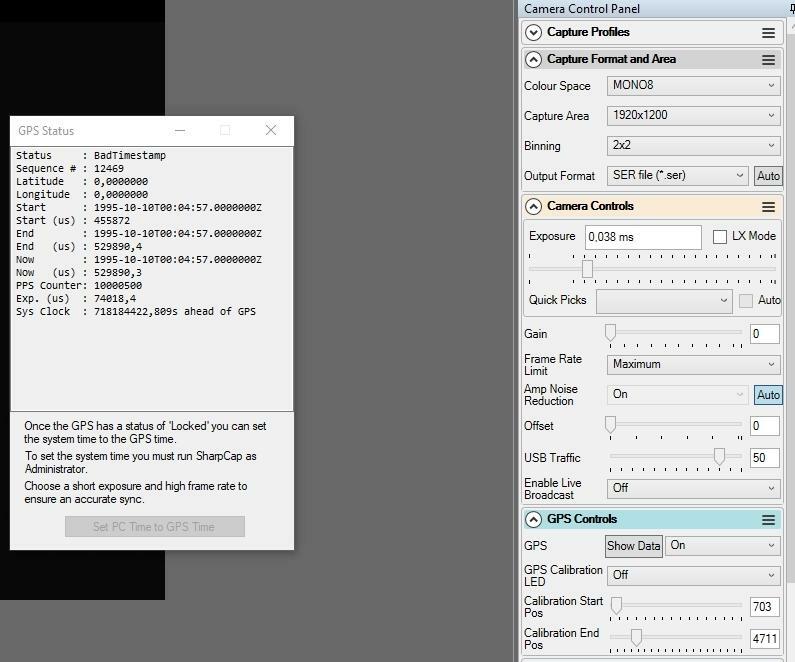 If I plug in the GPS module while the camera is running then it moves to 'PartialData' within about 20 seconds (this means it has the time - at least roughly, but no location) and then to 'Locked' in another minute or two. I wonder if you might have a hardware issue with the GPS module? I have setup my camera settings to be the same as yours shown above and the GPS works fine. I believe that QHY have a test application that can read the GPS data from the camera (that's pretty much all it does). Maybe worth contacting them to get a copy of that and if that fails to read the data too then it would point to a possible hardware problem. thank you for this answer I will investigate this side. I was going to ask if you'd connected the antenna as that would be the response if you hadn't. Then I remembered that the antenna module that came with my camera wasn't very reliable. I already had another one which I swapped in and it hasn't missed a beat since then. ok, I'll see with QHY to see if it's possible to get another one. as for my other problem I still have no solution either. until now I had to deconect the camera to be able to relaunch it. I just realized that if I change the format of the 640 * 480 image or whatever, it would restart it normally ... until it crashed again. what can it come from? camera? GPS? Sharpcap bug? b) incompatibility between the camera and the USB3 port/chipset it is connected to. I have two separate USB3 chipsets on my PC, one is on an addon card, one on the motherboard. My QHY174 GPS works fine with the one on the motherboard but shows the same symptoms of random freezes and needing to be replugged with the one on the addon card.